The modern day Buffalo evolved into its current form around 7,000 years ago and is a smaller descendant of the Woolly Mammoth. So abundant and successful were these giant herds that there roaming’s darkened the Western horizon line for miles and miles as far as the eye could see. An 18th century observer noted that, “it would have been as easy to count the number of leaves in a forest as to calculate the number of buffalo on the Plains…” (William T. Hornaday from The Buffalo Hunters) This enduring herd animal illustrates the immensity and abundance of land and sky that was the historical Western Great Plains. Before gunpowder and domesticated horses arrived on the plains, native tribes hunted buffalo on foot with their bare hands. Disguising themselves in wolf pelts, a stealthy hunter would slowly crawl on hands and knees in among a herd and quietly strike an individual calf without causing a disturbance big enough to light a stamped. Should the hunter spook the herd, it often meant certain death. In those times, the dangers of the hunt equaled the reward. The bison and the Plains tribes were energetically one peoples. Buffalo medicine recognizes that life lives on life. Life eats life. And life is born from life. The cycles of creation and destruction are not to be feared if honored with gratitude. We do not have to struggle to achieve our goals when we honor the resources we already have. Abundance does not come from working ‘hard.’ It comes from learning to enjoy the effort of our tasks. White Buffalo Calf Woman brought Buffalo medicine to the Lakota people as a gift in the form of a pipe. Because of this, the lessons of Buffalo Medicine are found within the drifting blue smoke of the sacred peace pipe. Smoke is used as medicine in Lakota ways and teaches that wealth is a state of mind no matter what your material objects add up to. When you are having fun, enjoying what you have, you are rich beyond measure. If you find there is no enjoyment in the task before you, ask yourself if you should continue. Have you secretly made a contract to suffer in the hopes that your suffering will deserve reward? Is it time to change tactics? All you have in life is how you spend your time. Suffering through a task in the hopes of some future gain is a confounding trick of the mind that will never return the profits you seek until you drop the the mental anguish and enjoy what you have, no matter how humble or grand. Bison follows the easiest path. Your personal path, though full of obstacles, is ultimately the easiest path you could take because it is the most fulfilling. If you find you must continue in a task that seems a burden, ask yourself how you can make it fun. Listen to the thoughts that cause your discontent. What conclusions have you made that are blocking your enjoyment? What judgments can you let go of to open the range of your experience? Another message of Buffalo asks you to look at your relationship to prayer. A much abused word, prayer is not about folding your hands and asking unseen forces for the things you want. 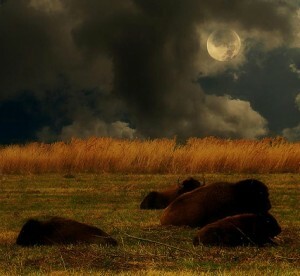 A prayer in the Buffalo medicine way is a Shaman’s gesture of wonder and awe. It is the act of beholding the magnificence of Earth and the cycles of life and death. Buffalo reminds you to let go of your desires long enough to receive that which you desire. If you are too full of wanting, how can you receive that which you want? If Buffalo is meandering through the fields this month be grateful for what you have before seeking more. By finding the sacred in the mundane we receive more than we could have ever imagined was there. Joseph Campbell, the American Mythologist lectured on the messages found in the Buffalo Myths of the Plains tribes. Listen here to his telling of how the Buffalo Dance ceremony came to be among the Black Foot tribes.